As one of the least developed countries in the world, Madagascar bears little resemblance to France, yet there are constant reminders of cultural trickle from its period as a French colony. French is one of the two official languages of the country along with Malagasy. Not many people speak much French, but most know enough to greet me with a "bonjour" and sometimes with a "papi" or "papa" attached. Children frequently call out "vazaha," (white person), as I pass, almost as an alert to those around so they can come quick and get a gander. There's nothing impolite about it. Those with some grounding in French will give me a "bon voyage." Considering the demands of these travels "bon courage" would be more appropriate, but I appreciate the spirit. Though I'm often plopped on the ground in the shade eating noodles out of my Tupperware bowl, only once has a passerby conveyed a "bon appetite," which is almost mandatory in France. Late in the day when it has begun to cool and the shadows are long I am instantly transported to France when I see a gathering of men playing and watching pétanque, a most common site in France. 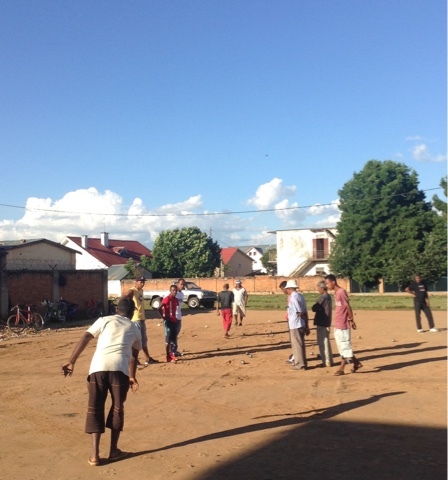 There are good enough players here that Madagascar won the world championship in 1999. The gendarmes wear the same contemporary blue uniforms and caps of their counterparts in France and are most cordial and dignified. And I am hearkened back to France with every passing kilometer, as they are marked by the same posts as in France, though doffed by red rather than yellow. But nothing could signify the imprint of France on the Malagasy more than the site of a Johhny Hallyday concert DVD in a small shop in an out-of-the-way rundown small town that offered WIFI. If he has a following here, even though he didn't hit the rock-n-roll scene until well after Madagascar gained its independence in 1960, the Malagasy truly do have some French blood running in their veins. I've seen no evidence though of a love of cheese, nor of couscous, both popular in France. 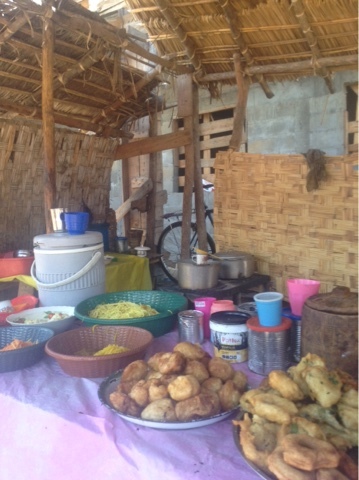 Apart from the variety of patties, dumpling and fritters, or "thingies" as one touring cyclist on crazyguyonabike.com referred to them, the predominant food on offer from small stands is noodles, quite a surprise, as rice is the center of the Malagasy diet, but evidently just in their own kitchens. Or perhaps they only prefer it fresh and wouldn't be inclined to eat rice that had been sitting out for hours. The roads have even less traffic than the small departmental roads of France, but one has to be ever vigilant for potholes. There seems no road maintenance. On bad stretches someone will stand by the holes with a rake pretending to be repairing them and hoping for a donation from motorists when they slow to pass through. 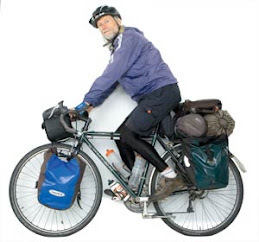 It is reminsicent of the Pan-American highway through Peru that I biked in 1989 where drifting sand would block the road and opportunistic men would stand by with shovels to help motorists through for a fee. After a day of rest in Antsirabe up at 5,000 feet I am somewhat revitalized after pushing myself to the limit day after day in the coastal heat and two-day climb back up to the highlands. It is still hot, near 80, but not as oppressive as the high 90s of the lower elevations. When I make a descent in the rolling terrain of the highlands I can feel some cool in the air, just what I need for my overheating engine. There are even natural springs spewing water that I can use to cool myself. That is the ultimate luxury after days of limited water. It is no wonder that the majority of the island's twenty-four million inhabitants live in the highlands. That land is a patchwork of small rice paddies and cornfields, some on terraces. I will spend as much of my remaining two weeks on the highlands as I can. I spent much of my day of rest eating and laying about, even getting a nap beside my tent in a compound of bungalows. Only two of the twenty bungalows were occupied, one by a Malagasy family and the other by a 60-year Frenchman and his wife. It was his third visit to Madagascar. He only travels to former French colonies. His only visit to the Americas was to French Guyana. I spent two hours at an Internet cafe down an alley with the prime objective of regaining access to my email. For the second time here Yahoo was suspicious of someone using Yahoo mail in this out-of-the-way place. I spent nearly 45 minutes using FaceTime and Magic Jack talking to Janina as Yahoo texted and emailed her codes for me to reaccess my account. Just another of the many frustrations of Madagascar. Yahoo wasn't alone, as Google had earlier denied me access to my blog, but it wasn't so tyrannical in keeping me off. During my two hours at the cafe, which had three ancient computers, the only customer was someone taking advantage of its copying services. It wasn't the expense so much, as my two hours cost thirty cents, but more a lack of computer-consciousness. It was refreshing, at least, that the terminals weren't packed with teen-aged boys playing militaristic video games, as was so prevalent in Turkey and China. While I was talking to Janina, the young proprietor brought his sign into the shop. I thought it might be an indication that he was closing, but it was only four and he made no gesture to me that he was closing. I talked with Janina for another half hour and then sent off a couple of emails after we hung up, the most important to Ralph informing him that my Cannes credentials had been verified so he didn't need to come to my assistance, as I had been struggling to register with the unreliable Internet here. Still no indication that he wished to close. But when I rose to leave, he closed up. 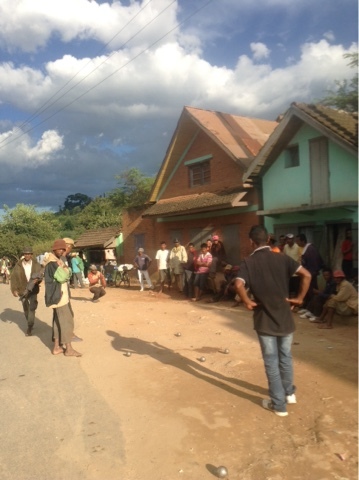 It was another example of the supreme cordiality of the Malagasy, more than compensating for all the headaches.